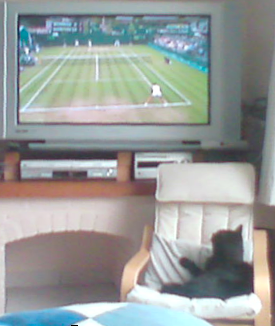 Got back from my last exam just on time to see the Kuznetsova-Wickmayer game at Wimbledon. Mouser is also watching it from an uneasy angle. A lot of moving about always holds kitteh's attention for at least 10 minutes or so. I honestly thought these things only happened in Police Academy movies or to the bad guys in the A-Team series. 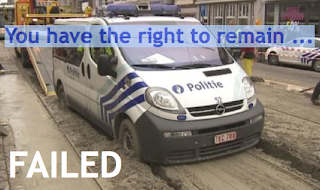 Some boys in blue were heading out to a robbery not far from Antwerp. They decided to take the tram lane because the regular road was too busy. Only, they failed to notice there were works going on and the men had just poured out some fresh concrete. Needless to say they got bogged down after a few yards. I can just imagine the embarrassment they experienced when they called it in. I must be one of the few people on the planet that hasn't seen the complete Lord of the Rings movie trilogy. Eight years after the last movie came out I have finally seen the first two episodes. Friday was The Two Towers one. 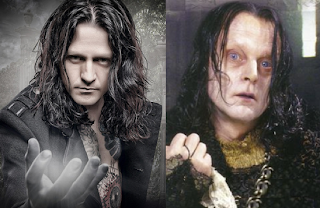 It struck me as quite funny to see that Gríma Wormtongue is a dead ringer for Channel Zero lead singer Franky De Smet Van Damme. If they are by any chance related, or share the same hairdresser, I think we must be told. 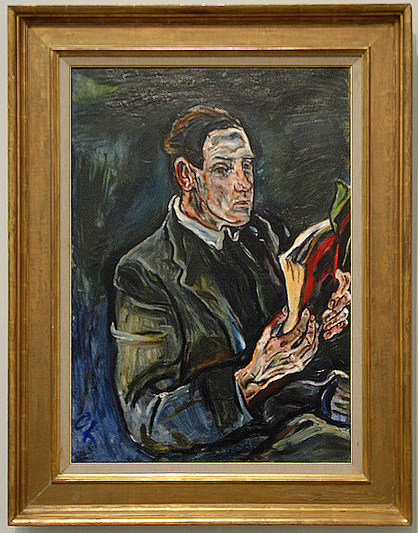 In the Nazi-era restitution of art news corner, The Museum of Fine Arts in Ghent has decided not to return 'Portrait of Ludwig Adler' by Oskar Kokoschka to the heirs of Von Klemperer. 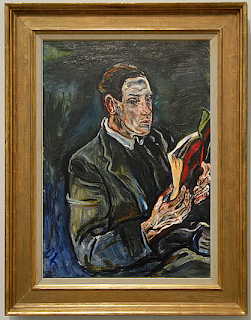 They argued that the Jewish banker and Dresdener art collector Victor Von Klemperer was forced to sell the piece under pressure in 1937 and they filed a case to recover the work on the grounds of historical circumstances and international treaties on the returning of looted jewish art. The City of Ghent had an independent commision, chaired by former president of the Studiecommissie en de Commissie voor de schadeloosstelling van de Joodse Gemeenschap van België, look at the claims. According to them Von Klemperer was not pressured to sell the work. On the basis of this advice the painting, which was acquired legally by the Museum in 1989 will not be returned. 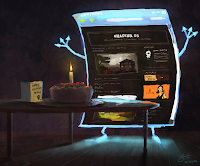 4 years in the blogosphere today. What has happenend during the last year? - We've moved house (again) and become houseowners, which is probably the biggest thing that could happen. - Dr Livingstone's back and other skeletal bits and bobs have taken a turn for the worse. - My bookcollection has grown (but not much). - I haven't used the folding bike I bought back in October, my elbows still are not ok and I'm not even able to carry the thing a couple of meters. - Finishing up two degrees in Art History. - Dr Livingstone is negotiating a status quo for his aching body by going swimming three times a week. - Refurbing a room or two and/or part of the garden. - Helping out dear Dr Livingstone in his shop. The soldering art historian. - Writing a lot of interesting papers and spending more time in dusty archives. News outlets are reporting the theft of an Ensor drawing The triumph of death (1887) from the Communal Museum in The Hague. A spokesperson euphimistically described the work as 'missing' rather than 'robbed'. 'There are different possible scenario's. The case is now in the hands of the police'. The piece was found missing on Friday. 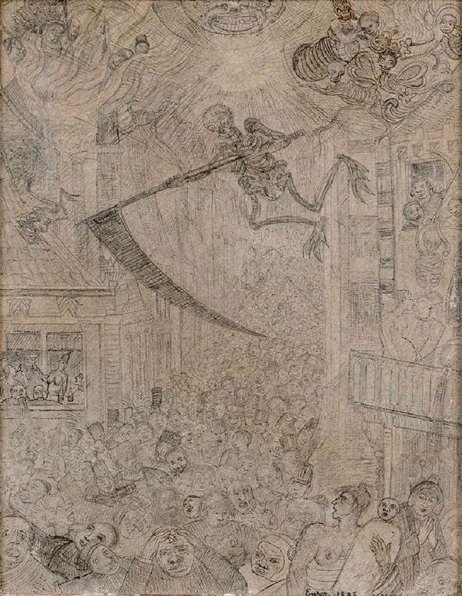 It is pretty embarrassing for them as the pencil on paper drawing (22,5 x 17 cm) was on loan from the Royal Museum of Fine Arts Antwerp who purchased the work from Brussels art collector Marcel Mabille in 1952. In the news yesterday: A blogger who was dragged into court for calling a businessman a white collar criminal has been acquitted of libel. According to the court a blogger is a kind of journalist. Actually he wasn't acquitted, the Court of Appeal ruled it could not judge a media related crime as it is not authorized to do so. So the first conviction was overturned. Which leaves the business man with a choice: he can file his complaint again and then it will be tried by the Court of Assize. Which is rare, as press-related cases are very rarely tried before a jury. It just costs too much money to start up the procedure and magistrates are busy enough as it is with tons of other stuff. 1) Why is a blogger seen as a journalist? Does that give him special powers? I think the blogger's lawyers 'don't shut up the freedom of the press'-line worked in this case, as the judge followed the same reasoning in his summing up. Which is problematic at best, considering the context of the wording of the ruling isn't known. News outlets only copy the 'blogger is journalist' line. 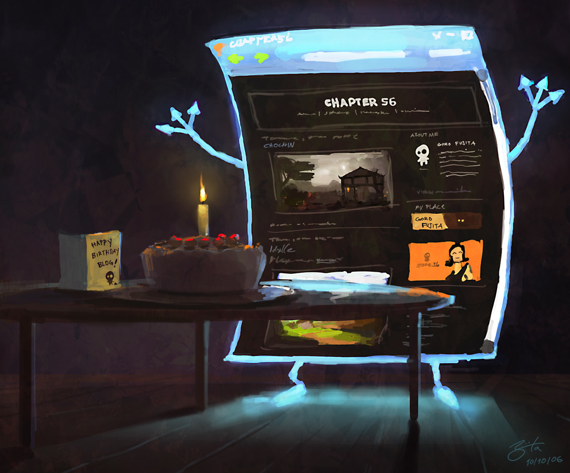 [Which, incidently, is something I'm doing too, just to direct a bit of traffic to my blog]. 2) Why is this reported in media with the headline 'bloggers are journalists' when the judge clearly stated they are some kind of journalist. It is not the same. 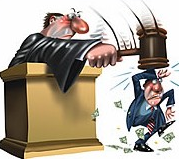 Anyway, the ruling isn't actually a ruling it has just dismissed the case, it will not have any impact irregardless if the lawyer of the defendant seems to think so. He is playing it up a bit me thinkst. If the outcome was negative he would have got on his high horse and shouted that the freedom of speech had been tainted. But in fact, the ruling from the first court seems correct to me and the judge in the Appeal Court played it safe. If you are venting an opinion you are entitled to do so, but to publish it is something different. Actually the plaintiff should prove, when bringing his case to court, he has actually suffered damage because of the alleged slander. Now correct me if I'm wrong, but that is what I can remember from my media-ethics classes. It does not suffice to just go: 'I've been insulted'. That is how the stupid British Libel laws work. Not here. I don't know the details of the original case but I'd like to find out. Slap a wig on him and you wouldn't notice the difference! 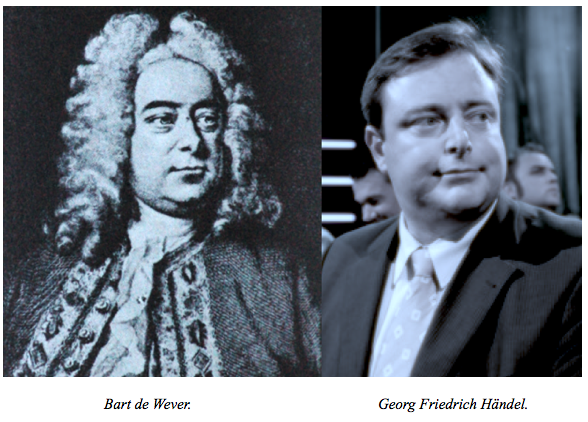 It is uncanny how Bart de Wever, the man famous for using Latin expressions, resembles Georg Friedrich Händel, the man famous for setting Latin words to music. Are they by any chance related? I think we must be told. I found the image in one of Dr Livingstone's old study books on music. I chuckled when I first saw the section on the baroque composers. I had an exam on musical history today. It went quite well considering I have damaged hearing. So I couldn't really tell if the instrument we had to recognize was a french horn or a trumpet. Oh, and the professor said I did Mahler an injustice by ranking him as the more conservative composers in the romantic period. I told him Mahler really wouldn't have minded since he is long dead. 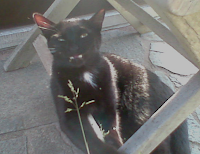 He gave me a funny look. I don't know if that was a bad thing or not. Finally made it to the hairdresser this week. I had been postponing it due to lack of time. Dr Livingstone told me I had waited long enough to have it done again and told me accordingly I looked like a chav. Miel was his usual charming self, coming up to me and grunting to receive a cookie that comes with the drink. 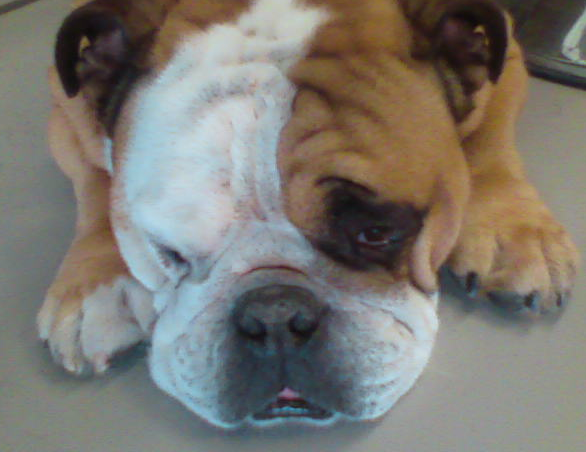 He must be the cutest bulldog I know. Come to think of it, he has the character of a cat: Likes to hang around you, but sits at a distance; is curious about everything but only comes when he feels like it. Or should that be pussover? 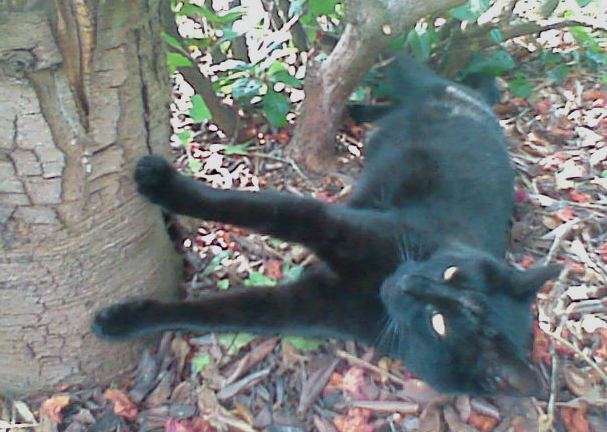 Here kitteh is trying to push over a tree while having a little rest from resting all day. Apparently I'm fun to hang around with. Two Garden Panthers™ seem to think so and grace me with their company now and then. In an eerily similar fashion. Maybe Mouser and Bonnie are trying to lure me into a false sense of security and haven't decided yet when exactly they'll be eating me. A rare specimen of the recently discovered Garden Panther (Panthera gardengnomus negra) feeding on its pray. This species, spotted throughout Northern Europe, thrives in its natural habitat in suburbuban Flanders. Known for its impertinence toward garden furniture, this soletary hunter is known to manipulate the Homo sapiens urbanus and taunt the female Canis lupus familiaris from next door. 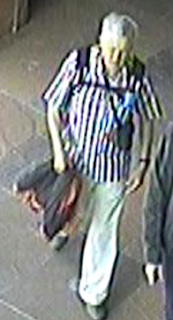 Today police have released CCTV footage showing the thief who boldly stole a powder horn in the new Antwerp city museum MAS on May 26th. It seems art theft investigation looks very inefficient and slow and does not seem to be a priority. Two weeks after the theft took place pictures of the culprit are distributed and they are appealing to the public to identify a man and a woman. Also what puzzles me: the report in the paper mentions the thief walked up to the horn, removed it and then hides it under his jacket. He also had a back-pack. This begs the question, why are visitors not requested to leave their coats, bags etc. at the cloakroom? Watch out for those OAP's, they could use their appearance to lull security guards into a false sense of security. This thieving eminence grise does not look like David Niven or Pierce Brosnan, but he's just as effective as the fictional characters they portray in features or Stéphane Breitwieser for that matter. The title of today's post sounds like something from World War II, but it's about birds. Last month, when I didn't have time to do anything but slave over those papers there was a couple of Parus major nesting in our carport. 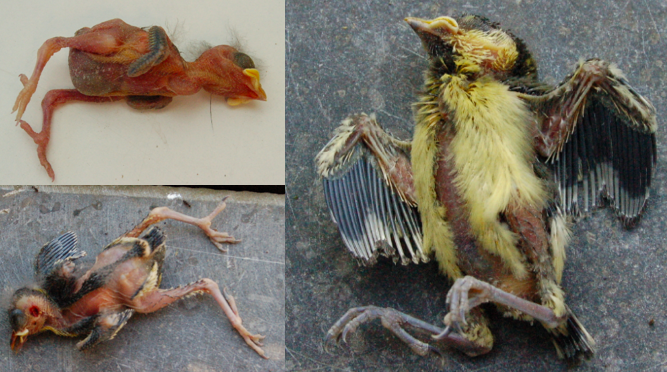 The little hatchlings crying out for food all day long. I don't know how many hatched in total, but there must have been three or more, because, sadly, three fell out of the nest with two day intervals. They were already done for, so I couldn't put them back. You can see the rapidity of arrested growth between the tiny cadavers. 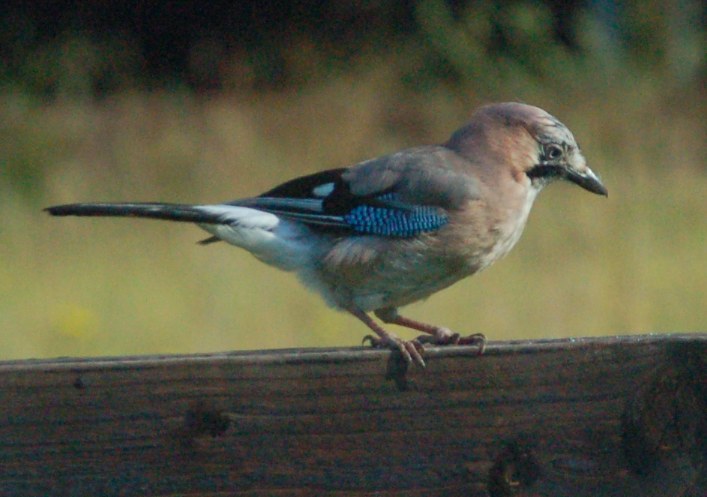 I noticed some Garrulus glandarius (Eurasian Jays) hanging around the garden about a week ago. I start my study cycle each morning about half eight in the conservatory. I put down bread now every day on the fence so they can have a nibble. It's mostly just one solitary bird checking everything out. They're very shifty, just like magpies. I decided to get the camera out and take a few snaps while drinking my first cup of coffee. No sooner had I started waiting in true paperazzi-style and three (!) of them showed up. I got some nice pictures, I even shot one through the screen and it gave me a lovely Marlène Dietrich effect. Or 16 minutes and 40 seconds. Enough for a cookery show to produce a three course meal and maybe enough to finally have a break-through to help answer the question why we live in a matter universe and not an antimatter one. The question I'm most concerned with is, if we can, in a not too distant future, harness antigravity so I don't break stuff when it slips from the hand and is attracted to the floor. And have teleportation. And loads of other cool stuff. 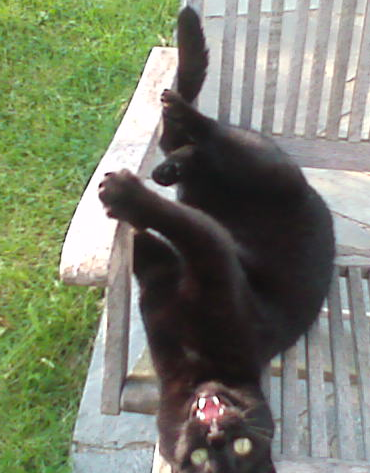 I don't know what's wrong with the kittehs. Mouser went ballistic too yesterday morning. Must be the odour Bonnie left behind or something. They love those chairs for some strange reason. It's being used as a kitteh jungle gym. I have a picture of Mouser just before it slid through the gap at the side and fell off. 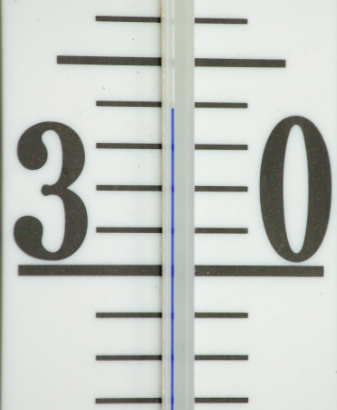 It is nearly 2 pm and the temperature in the conservatory has already reached 34ºC. 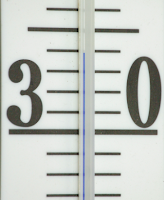 Yesterday it peaked at 38ºC. 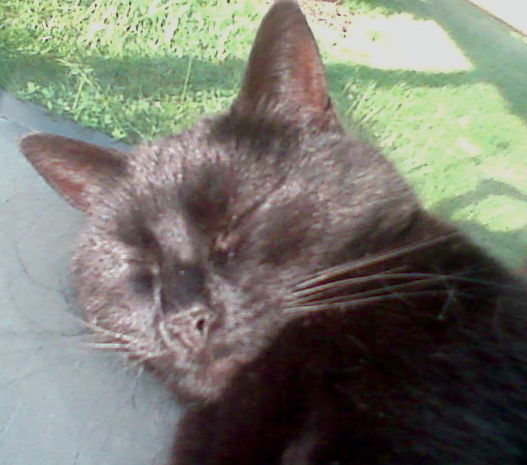 It's currently 29,3ºC in the shade outside. That's where I'm at. I managed to keep the house inside at a cool-ish 24ºC. Without airconditioning or fans. \o/ If it'd be isolated (ceiling, walls, windows) it could probably be kept even cooler. Mind you, I didn't really open up all windows during the night to let the night air in. Because that'll also let in all the midges. And Dr Livingstone is not here to get stung in my place. Mouser is also inside the house, reposing on a bed. It doesn't want to come out at all. Usually Velvet Claws is in the kitchen in a flash when the fridge door is opened. But not so now. I wish I was be able to have a nice lie down in my hammock right now. But no. I need to get through the First World War and the Interbellum. Bleh. I hope I'm all done by this evening, then I can finish up Music History tomorrow. Apart from Mouser this other cat, Bonnie, roams around the garden too. I hadn't seen it in a while, but yesterday afternoon it was back with a vengeance to get some attention. Making a lot of kitteh noises and jumping on seats which is out of bounds, even to Mouser [Kitteh has been trained not to do that kind of thing]. I had to shake the chair ferociously to get that darn Bonnie to jump off it. 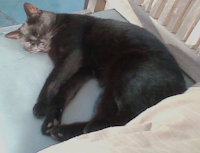 I couldn't overturn the cushion because it would hiss and lash out at me with its Super Sharp Claws™. It really clung to the chair. 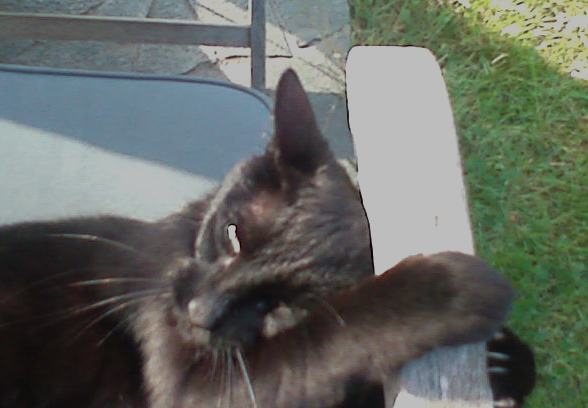 I managed to take a snap of the cat hanging on to the arm rest while I was trying to remove the Garden Panther™. 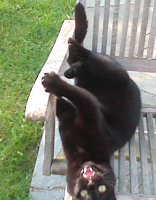 I also took a shot of Bonnie while kitteh was rather miffed at having been ousted from the sitting implement. Not much going on here. Me cramming for the upcoming exams. That's about it. Getting up, bucket loads of coffee, some things on people long dead, more coffee, sleep. I'm already lagging behind my study schedule, no thanks to that annoying illness which has lasted up till Monday. My head is starting to clear up, but tissues are still on the table at arm's reach. 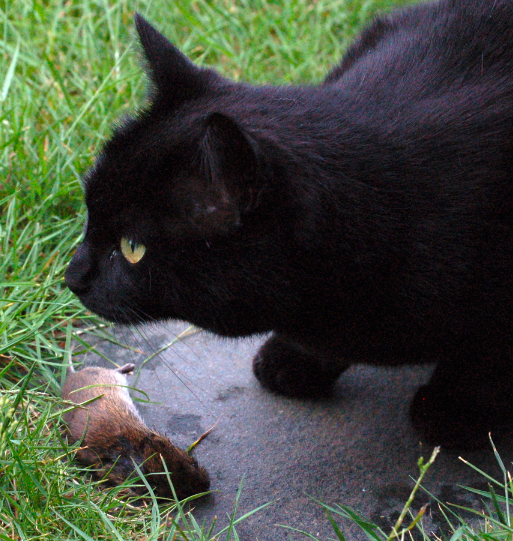 Mouser has granted me the privilege to grace me with its presence and hang around within strolling distance. When I'm in the conservatory teh kitteh takes up half of the bench. When it's too hot, Mouser goes and sleeps under one of the shrubberies just outside so it can still see me. Yesterday it did engage in stalking some pigeons and brought me two mice. Saves me giving Velvet Claws dindins I'm not supposed to give. Anyway, I should be getting back. I need to do a 100 page chapter today. Joy. I hear yelping at the front door. I expect that'll be another fresh mouse for brekkers.